It’s really out! I’ve been working on this article ever since I finished my master’s, and it finally got published. It turned out super well – I am so happy about this! My first first-author article in a scientific journal! 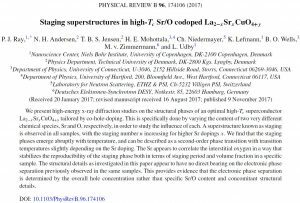 This is basically our reporting on the old hard X-ray measurements that I got to do my master’s thesis on – measurements of the staging superstructure observed in several different samples of single crystal LSCO+O. The measurements were done at several temperatures from down to 5-10 K, up to room temperature – giving us the opportunity to see how the staging appears at different temperatures depending on the doping in the samples. We also reported on the observed cooling rate dependence, which was found to depend on the amount of Sr doping in the samples.